The CIA helped train the Iranian security services in torture techniques—techniques borrowed, as in the case of Pinochet’s Chile, from the experienced experts, the Nazis. Every year 350 SAVAK agents were taken to CIA training facilities in Virginia, where they learned interrogation and torture. Top SAVAK brass were trained through the US Agency for International Development’s (USAID) Public Safety Program. SAVAK created torture prisons that outdid Dante’s Hell. The CIA filmed techniques it had taught SAVAK to use and made them available to torture centers in other countries. The 2017 protests in Iran were sparked by cuts to social benefits, a consequence of sanctions and US-Saudi engineered fall in oil prices. Washington spent over $1 million trying to convert the protests into a push for regime change, and another $20 million on Voice of America’s Persian Service seeking to turn Iranians against the government. 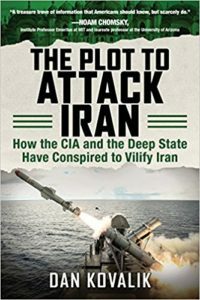 The Plot to Attack Iran gives us a well-referenced summary to the US war against Iranian democracy and the complex situation in the Middle East. The US has been backing groups it is also at times fighting, groups that still engage in terrorist attacks against the US, France, and Britain. Kovalik’s book is a useful resource for our anti-imperialist movement. We get a taste of what liberal-lefts will say and do as the US advances its regime change strategy in Iran by looking at how they responded to the US attack on Libya and on Syria. The Plot to Attack Iran will aid us when we confront the same expected capitulation by much of this “left” when the US pushes ahead with its war plans on Iran. Stansfield Smith, Chicago ALBA Solidarity, is a long time Latin America solidarity activist, and presently puts out the AFGJ Venezuela Weekly. He is also the Senior Research Fellow at the Council on Hemispheric Affairs. Read other articles by Stansfield. This article was posted on Thursday, May 3rd, 2018 at 6:46pm and is filed under Afghanistan, Book Review, Chemical weapons, CIA, Crimes against Humanity, Donald Trump, Fake News, Iran, Iraq, ISIS, Israel, Libya, Media, Militarism, Osama Bin Laden, President Bashar al-Assad, Propaganda, Revolution, Sanctions, Saudi Arabia, Syria, United States, US Hypocrisy, US Lies, US Terrorism, War Crimes, Yemen.